= Hey Master! Give me a cup of green tea, please. お腹すいてる？ ( = Onaka suiteru?) = Are you hungry? Good! Because today’s lesson is about SUSHI!!! I know everybody likes sushi! Me,too!! We use it when we describe a person who knows something very well. In conversation, we refer to somebody who shows their knowledge of something, “通” ( = tsū) as a compliment or sometimes we use it to tease somebody, in a joking manner. Sometime 通 ( = tsū) people use some specialized vocabulary or jargon. = Hey Master, give me a cup of green tea please! Note : Also when we say 白身の魚= shiromi no sakana, it implies “white-fleshed fish”. 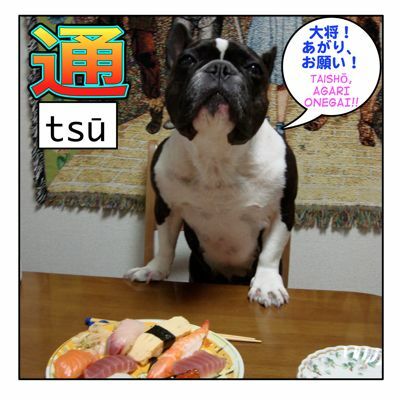 ● 大とろ ( = ootoro) or 大トロ ( = ootoro ) When the “toro” is very fatty, we call it 大トロ ( = ootoro). It is very expensive. 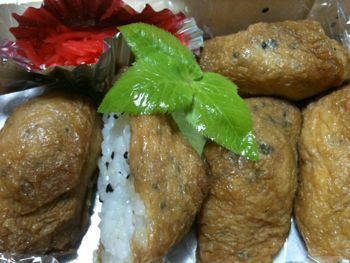 The vinegared rice is called 寿司めし ( = sushi meshi ) or 酢めし ( = sumeshi). This is the general way we prepare 寿司飯 = sushimeshi = sushi rice. Cook ４ cups of rice with 昆布 = konbu = kelp on top using a regular rice cooker. Mix two teaspoons of salt, 4 tablespoons of sugar, 4 tablespoon of 米酢 ( = komesu) rice vinegar. And add them to the hot rice and mix. You have to fan the rice while you mix them gently. Be careful not to mix the rice too hard when you are mixing it. むらさき = ムラサキ (= murasaki )= the literal meaning is ”purple” but it means 醤油 = しょう油 = shōyu = soy sauce. = Kodomo no bun wa sabinuki de onegai shimasu. = Please prepare the sushi without wasabi for my child. 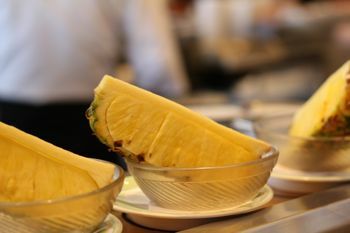 がり／ガリ = gari (← しょうが = shouga = ginger) = thin sweet pickled sliced gingered. !candy! バレン = baren = the green leaf (usually plastic) that you put in sushi for decoration. Now let’s talk about some of the more basic Sushi words first. 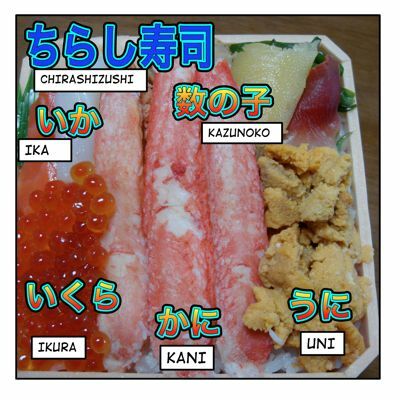 Note : Sometimes the pronunciation of “すし” = “sushi” will be ずし=”zuushi” when it is combined with other word. They run the gamut from the very cheap (100 yen each) to the VERY expensive (2,000 yen or more for 1 piece). Of course, if you want to try the best sushi, try the most expensive sushi you can comfortably afford. Some of them don’t even have price tags! They are just labeled 時価 = jika =AQ, market value. I can guarantee that it would a quite adventurous experience for you in Japan! 盛り合わせ ( = moriawase) = assorted sushi. 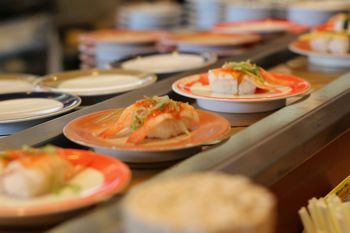 These are usually set at a fixed price on the menu (as opposed to a fluctuating daily market price) and will allow you to enjoy a variety of sushi with one simple order. 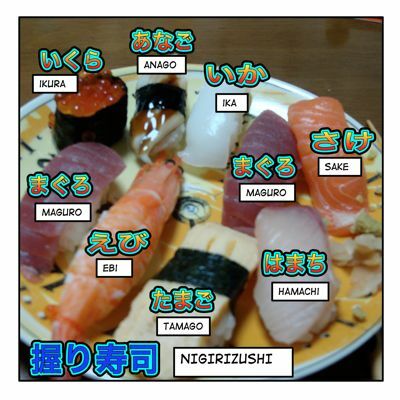 They are a few kinds of 盛り合わせ ( = moriawase) = assorted sushi depending on the kinds of fish and seafood served. 並 ( = nami) is economically priced. 上 ( = jou) is high priced and of good quality of sushi. (特上 ( = tokujou) is even better than 上 ( = jou)). What kind of sushi we have?? They put wasabi = spicy green horse radish between the rice and fish. You dip it in soy sauce and eat it. You can either use your fingers or chopsticks. 軍艦 = gunkan means “navy ship” it looks like this. Usually when you roll sushi, nori is on the outside but with uramaki the rice is on the outside. 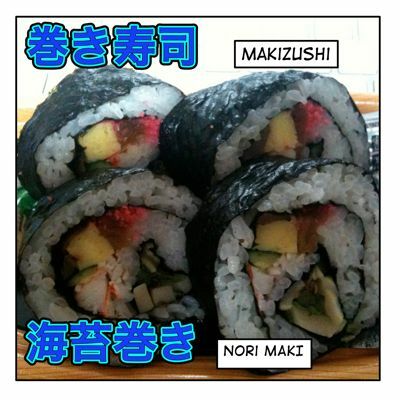 ●手巻き寿し ( = temaki zushi =) a form of rolled sushi in a rolled or corn shape. 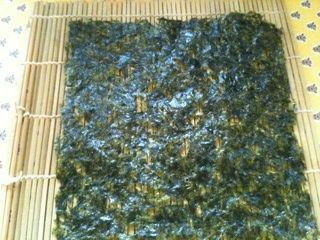 We often have 手巻き寿司パーティー ( = Temaki zushi paatii =) Temaki sushi party at home serving a big bowl of sushi rice and lots of ネタ ( = neta ) = fresh fish ingredients or　具 = gu = ingredient to put inside of the sushi rolls. and wrap it with Nori and make your own sushi. First prepare 油揚げ ( = aburaage)= fried tofu cooked in soy sauce and sugar and drained of the excess liquid. 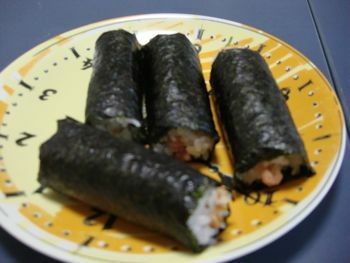 Then stuff them with sweetened vinegared rice ( = sushi rice). ちらし寿司= chirashi zushi = a bowel of sushi rice topped with various thin sliced raw fish. 押し寿司 = Oshi Zushi = Square Pressed sushi. Put rice in the wooden box below, and top it with cooked or marinated fish. Slice and eat. (Cultural Note : There are mainly three types of miso in Japan, 赤味噌 ( = akamiso)= red miso ,白味噌 ( = shiro miso )= white miso and 合わせ味噌 = red and white miso mixed depending on the region. When you have a chance to talk to Japanese, ask which miso they use for miso soup. 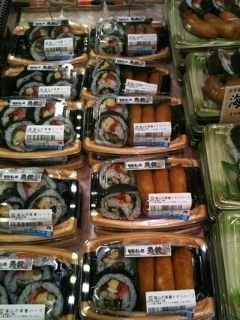 You can buy sushi almost anywhere in Japan — even at the convenience stores. But if you have a chance to go to a real sushi restaurant, try to sit at the counter. You can enjoy how they make sushi in front of you. It is very artistic. And If you are a wannabe 通 ( = tsū) like Maggie Sensei, you should try to make small talk with the chefs. That would be very cool! = Welcome to our restaurant! •「四人です。」= yonin desu. = Four people…..
= Please seat yourself anywhere that’s open. = Please seat yourself anywhere. = Kauntaa seki aite imasuka? = Are counter seats available? = Teiburu seki onegai shimasu. = OK, what do you want to start with? Note : Do you know what to start with? Some 通= tsū thinks it is better to start with light flavored fish such as white flesh fish and gradually go on to the strong flavored fish like トロ ( = toro) = the fatty part of tuna or 穴子 ( = anago) grilled conger eel. Or some thinks it is cool to start with トロ ( = toro )= the fatty part of tuna or to start from 玉 ( = gyoku ) sweetened Japanese omelet because if they eat it, they will tell if it is a good chef or not. = Kyou wa nanika ii neta arimasuka? = What do you recommend today? = Kyou wa hamachi ga iino haitte imasuyo. = We have good yellow tail today. = OK, then I will start with that. = Mazu maguro nigitte kudasai. = Onomimono wa nani ni nasai masu ka? = What would you like to drink? = Toriaezu biiru. Namachuu onegai shimasu. = I will start with beer. A medium size draft beer in a mug please. Cultural note : 「取りあえずビール。」( = toriaezu biiru) is a very fun and typical line for Japanese drinkers. = (Make me ~ ) please. = Conger eel (here) please. Note : ここ(= koko) indicates the place where you are. = Make me ~ please. = Tsugi maguro nigitte kudasai. = Shiromi no sakana nanka nigitte kudasai. = Serve me something with white-fleshed fish. Then they will tell you what’s good. There are a lot of ネタ ( = neta)= fresh raw fish for sushi in the transparent show case right in front of you. Feel free to ask the chef by pointing at it. = A cup of green tea, please. When you finish eating, you ask for the check. = (Koko) oaiso onegai shimasu. = Please bring me a check please. How to have sushi delivered to your house by ordering it over the phone! Some of them put their menu fliers in the mail box. Let’s order in some sushi! = Hai, Yukari zushi desu. = Yes, this is Yukari Zushi. = Sumimasen. Sochirawa demae yatte irasshaimasu ka? = Do you deliver sushi? = Osushi no demae onegai shimasu. = I would like you to deliver sushi, please. = Sumimasen. Takuhai onegai shimasu. = Excuse me. I would like to order in sushi. = Hai, kashikomarimashita. Goriyou wa hajimete desuka? = Yes, madame. Is this your first time to order sushi? = Soredewa odenwabangou shigaikyokuban kara onegai itashimasu. = Then please give us your phone number starting with your area code. = Hai, zero go ichi no ichi ni san no yon gou roku nana desu. = Sorede wa gojuusho yuubingangou kara onegai itashimasu. = Now please give us your address starts from your zip code. = Yon roku zero zero zero zero…Inushi inumachi yonchoume ichiban. = It’s 460-0000 Inushi inumatchi yonchoume ichiban. = May I have your name? = Soredewa gochuumon wo uketawamarimasu. = And what would you like to order. = Jou nigiri ichininmae to negitoro don ichinin mae onegai shimasu. = Superior nigiri for one and negitoro (onion – fatty tuna rice bowl) for one, please. = Kakunin itashimasu. Jou nigiri ichininmae to negitoro don ichinin mae desune. Zenbu de 3,000 ni narimasu. = Let me confirm. Superior nigiri for one and negitorodon for one, right? That will be 3,000 in total. = Haitatsu jikan no gokibou wa? = What time would you like us to deliver? = Juuniji made ni onegai shimasu. = Ima michi ga konde iru node mousukoshi kakaru kamo shiremasen. = It may take more time to deliver because the streets are crowded right now. = Wakarimashita dekirudake hayaku onegai shimasu. = OK, but please deliver it as soon as possible. = I understand. Thank you so much. = Tokujou hitotsu ni nami hitotu onegai shimasu. = The extra best quality sushi one and medium grade sushi one please. = Nami nininmae onegai shimasu. = Medium grade sushi for two please. 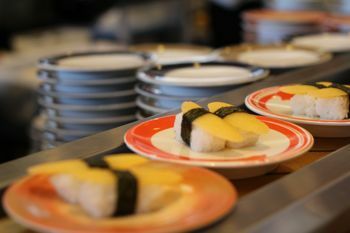 If you have a low budget or big family try 回転寿し = kaiten zushi = Rotating conveyor belt sushi. It is one of the fun restaurants in Japan to visit. I heard there are a lot of stores like this in the world now. It is very convenient. Once you seated, you just pick whatever you want. All kinds of sushi roll by on a conveyor sushi belt right in front of you. 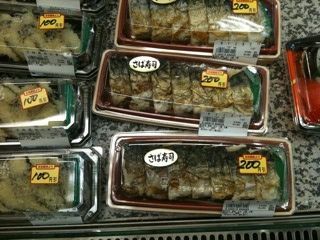 If you pick, トロ = toro = fat belly meat tuna, or ウニ ( = uni) = sea urchin they are expensive. Also you can find very westernized ingredients such as ツナマヨ = tsunamayo = canned/boiled tuna with mayo, コロッケ= korokke = croquette, ハンバーグ = hanbaagu = a hamburger patty, etc. Not just sushi but they also serve, fried food, dessert, etc. If you want to order something which is not on the conveyor belt, you can order directly from the chef. They comes to your seat and divide your plate into different color or design and calculate them immediately by counting the number of each plates. Unlike expensive sushi stores, you have to serve yourself tea, ginger, soy sauce and wasabi which are placed right in front of each seat. Now here is my favorite fun video from Japanese Tradition = 日本の形(= nihon no katachi). I hope you can enjoy this video more after learning all about sushi in this lesson! You will find a lot of contradictions in this video. They are funny!! For example, you will see a little dish with salt called 盛り塩 = morijio = a pile of salt. 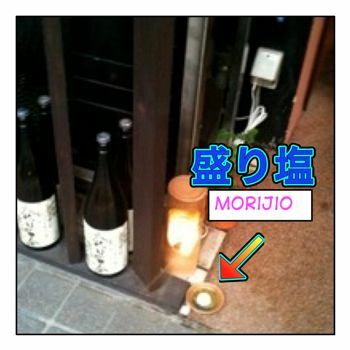 Many Japanese restaurants has a small dish with a pile of salt = 盛り塩 ( = morijio) outside by the entrance to attract customers at the same time. Salt is considered to purify the place. = Kono ressun wo benkyou shitara kitto minna osushi ga tabeni ikitaku naru to omou yo. 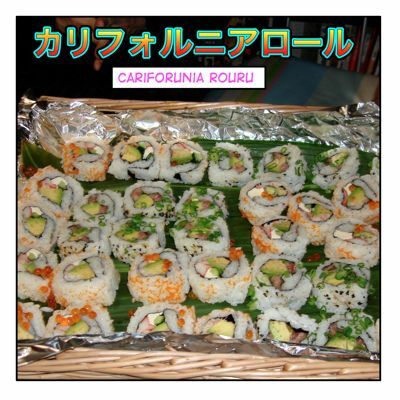 = I bet everybody wants to go eat sushi after studying this lesson! = Watashi ni omiyage katte kuru nowo wasurenai dene. Watashi wa toro daisuki dakarane! = Don’t forget to buy me a sushi to go. I love Toro, OK? May I know the difference between “itamae” and “taisho”? 板前 ( = itamae) means “(Japanese restaurant’s) chef” as an occupation. 大将( = taishou) originally means military “General” and it refers to owner of the restaurant or chief of chef. 常連客 (jourenkyaku), regular customers who go to the restaurant often and know the owner/chef well, you can address him “大将（たいしょう)” but you never address the chef, 板前 ( = itamae). My question for sensei. Are there any common or traditional Japanese dishes that do not involve fish? Oh that video is a joke video. Everything in the video is so extreme and exaggerated. I would say 5 pct of the video is true. That is why it is funny. Samurai have disappeared many many years ago so no worries. You are right. We eat a lot of fish in Japan but you can survive here without eating fish. There are a variety of food in Japan so I am sure you can find something that you would like. We do have traditional food without fish. Vegetable tempura, sukiyaki, shabushabu, beef bowls, etc.etc. But one thing that I can advice you is to be open minded. It would be much more fun to try many different things when you are in other country. And people would love you if you at least try to adjust Japanese culture. Oh sensei, with your comment I would like to make sure, isn’t there someone that actually still addresses himself as samurai? I have seen some TV bangumi where some experts of Japanese sword make appearances but maybe they are just experts, right? Sensei, I checked on those dishes you listed and they look delicious. As I suspected, Japanese dishes are very varied. Yes, I love the scene,too! There must be some groups that they call themselves samurai but it is hard to find them. And it is totally illegal to carry Katana around now. They will be arrested right away. ごめんなさい。魚はちょっと苦手なので.. 。= Gomennasai. Sakana wa chotto nigate nanode… = I am sorry but I am not a big fan of fish. They will understand you. There are Japanese people who don’t like fish as well. I am not sure if you have seen this lesson (B-kyuu gurume) but there are cheap Japanese food as well. Now I go check if I have a beautiful skin underneath of my fur…. I read that some fish is kind of dangerous for canines so please be careful sensei, ok? But I bet Yukarisama takes good care of you sensei. Sensei I recall once reading that there was some Japanese talent that didn’t like fish and following a TV program she was critiqued for asking someone what was his/her favorite type of sushi. Can’t remember who she was though. So I guess I am not alone. lol Unfortunately, even here in my country I am an exemption to the norm, actually I don’t think I know someone else who doesn’t like fish like me… lol depressing. I recall hearing an expression similar to what Maggiesensei wrote once, in a YouTube channel. I will practice it sensei, thank you very much. Yes, the simulation practice is very important! Be sure to visualize me in the scene and offering you a lot of fish. (・ω< ) Thank you! You are the only one who doesn't think I am not fat. Yukari"sama" always eats delicious sweets in front of me. She is torturing me! And you can say “ちょっと魚が苦手なので..” to me. Before you finish saying that I will eat yours. So no problem! I think I’ll pass on anything 踊り! But I’m so glad that now I know what they call it so if I see that anywhere to avoid it! The 稲荷寿司 sounds like a fantastic idea though! Thanks for a great lesson!!! Haha! It’s true. It is very important to know what to avoid! Thank you for your comment! Hope you come back to visit me soon! Hi Sensei! Thanks for this lesson. Hi, Amelie! Ohhh you are sushi love,too, huh? You know, in order to add more sushi pictures, I have to keep eating more sushi, Isn’t that “awful”? I just found out that a kind of neta I enjoyed a lot when I was in China (abura bouzu, or escolar in English) isn’t allowed to be served as neta in Japan. 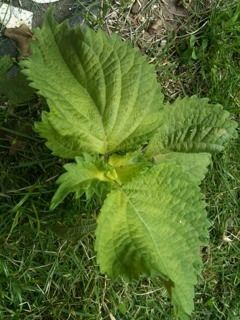 I didn’t have any problems after eating it, so I was surprised to read that it can cause digestive problems! :S Anyway, it was tasty! Wow! You had あぶらぼうず？ I am glad to hear it didn’t cause you any digestive problem! I so wanna try eel and 踊り now!! Grilled eel is pretty good!! Haha! I made you ペコペコ!!! !Vsain!